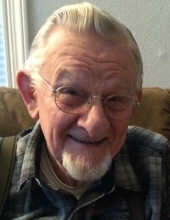 Edward Allen Sanders, 81, of South Beloit, IL died Monday, January 21, 2019 in Javon Bea Mercy Health Hospital after a brief illness. Born August 17, 1937 in Rockford, IL, the son of Mr. and Mrs. Elmore and Lucile (Beach) Sanders, attended East High School. Edward married the former Lorretta Jean Bubser in Rockford, IL on September 15, 1958. He was employed as a Tool Design Engineer by Woodward Inc. for over 32 years. Survivors include daughter Debora L. (Bert) Guild of Tampa, FL; son Curtis E. (Jonna) Sanders of Lake Summerset, IL; son Scott A. Sanders of Rockford, IL; son James A. Sanders of Janesville, WI; thirteen grandchildren and eight great grandchildren. He is preceded in death by his parents, wife, daughter-in-law Lily and brother Lawrence. A Funeral Ceremony will be held at 11:00 a.m., Friday, January 25, 2019 at McCorkle Funeral Home- Rockton Chapel, 767 N. Blackhawk Blvd, Rockton, IL with Pastor John Brennan of Heartland Community Church of Rockford, IL officiating. Burial will be in Willwood Burial Park. A visitation will be held at the Funeral Home from 5:00 p.m. until 7:00 p.m. on Thursday, January 24, 2019. To send flowers or a remembrance gift to the family of Edward Allen Sanders, please visit our Tribute Store. "Email Address" would like to share the life celebration of Edward Allen Sanders. Click on the "link" to go to share a favorite memory or leave a condolence message for the family.